Sounds silly doesn’t it? 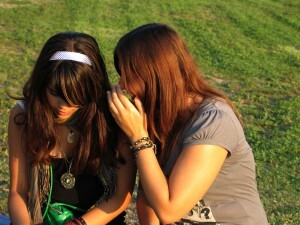 “Righteous Gossip,” is a contradiction in terms. But, seriously, isn’t that what we pretend it is? “I don’t want to sound like I am talking behind her back, but I am so concerned for her…” “I know you won’t think this is gossip, because I want you to pray for them with me…” Sound familiar? It does to me. Because I admit, I have done it. Haven’t you? Girls… We have become so skilled at speaking and behaving the way the world does, while simultaneously deluding ourselves into believing that we are somehow set apart and different. We have done something utterly dangerous. We have figured out how to define our worldly ways with religiosity, so we can excuse what we have been commanded not to do, by pretending there are righteous motives behind our actions. After all, Jesus got ticked and flipped over a vendor table smack dab in the middle of the temple! That is not generally accepted behavior no matter what century you are in. So clearly, there must be gray areas where we can skirt the rules, right? Wrong. One, He’s God, He can flip whatever He fancies without explanation. Secondly, it was our Jesus acting out of righteous anger and putting a stop to sin in His own house. When we gossip in the body of Christ, the church, His house, we are lucky He doesn’t flip us! Come on… Let’s be totally honest. There is this deep-down-little-tug, a little “uh-oh,” a little “don’t do it” sort-of-thing that tries to get our attention when we start to speak out of turn. Oh, but the details are so juicy and sweet. It is down right delectable to wait for the look on your friend’s face, and tantalizing to try to guess what her response will be. Then, there is the enormous satisfaction (albeit false) of it all, when we agree on a judgment and then pretend we really care about the outcome. But if it were really ok, if it were truly God in the midst of us, and His hand working it out for His glory, why the twinge of guilt? We don’t really feel good about flapping our lips, and so, we try to gloss over the guilt and convince ourselves that we had to dish the details so the truth may be known. So, we feel like dog doo, at least until we find another opportunity to cover those feelings over again with the thrill of telling someone else. May I be even a little overt here Sis, and throw in this tidbit? If you aren’t feeling the twinge and if you can say it all without a hint of “oops,” then it is time to get on your face before God… You have gotten too good at ignoring His merciful conviction, and that Dear One, is dangerous ground. It is no wonder that people wander into our churches and ask themselves, “How can this be the answer?” “How can this be better?” “How can this be the way?” The Word says that they will know we are Christian’s by our love (John 13:35). So, where is the love in gossip? You and I both know it isn’t there. Instead, true love is shoved down, trod over, and replaced with false care and concern. Sometimes, I think it is actually easier for non-Christians to discern righteous gossip for the fraud it is, then for the believer who has willingly settled for a watered down, world reflecting, sin subsidized religion. The Word of God (Proverbs 20:19) is clear and calls us “simple babblers” that reveal secrets, and warns others not to hang out with us if we fall into this trap! I don’t want to be that girl, do you? It is time to reflect a Christ centered, healed and changed, new creation faith! Let’s stop believing that being His hands and feet are an excuse to be His gossip girls. Being a Sunday School Teacher or a Deaconess does not give us a pass on what comes out of our mouths; no matter how we preface it, swath it in platitudes, or spin and suggest clever prayers. Service is wonderful, works are great, but our words… Our words, Sister, can bring life or death. Father, forgive us, change our hearts and let us share Your life and love with the words of our mouths. Let’s choose today to water seeds of faith with words of encouragement! Let’s edify one another with our own testimonies, and not use the information of others to flavor our conversations. Let us be salt, not dirt! Dish love and affection, centered on who Jesus is and what He has done for us. Build one another with the reminders of who we are in Christ, that our identities may rest in Him not our abilities to entice, entertain, or tear down. Let us open our mouths with wisdom and let the teaching of kindness be on our tongues (Proverbs 31:26). Ephesians 4:29 Do not let any unwholesome talk come out of your mouths, but only what is help for for building others up according to their needs, that it may benefit those who listen. Proverbs 12:18 Reckless words pierce like a sword, but the tongue of the wise brings healing.